There is an apple tree growing by the side of the road near me where the road has gone through what used to be a farm garden. 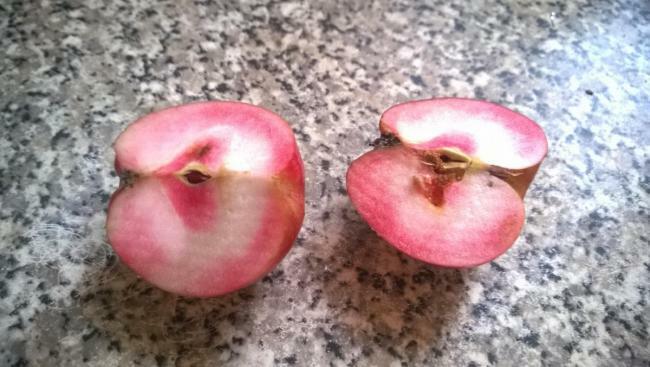 This apple is odd as it is red on the inside as well as the outside, it is a desert apple and really sweet. There is a story behind the name of the apple which is applicable to THL, any guesses? Red devil or Wisley Crab? A good guess there and not far off. This dessert/cider variety takes its name from a ********* who was shot whilst stealing apples from the Megginch estate in Scotland. The apples were thrown on a rubbish heap by his wife and one of the seedlings that emerged was subsequently named after his predicument and his job. The fruits are blood red, crisp and juicy. When very ripe, the flesh becomes stained pink. These apples sound excellent for making cider a few years back a farmer friend and myself in Cornwall drank a demijohn of cider that was red in colour I wonder if these were the apples used very interesting. Nope. Not even warm. Sorry. The bloody ploughmans apple ? The Scrumpers Blood Apple ?